This is the Ethiopian Shilcho brought to you by Noble Coffee Roasting. This fully washed coffee was grown by the Shilcho Cooperative in the Dara Woreda, Sidama Zone region of Ethiopia between 1,750 - 2,000 meters above sea level. We love this coffee for its nuanced notes of fruit like raspberries and peaches with a delicate floral note of early grey tea. Cannot get a properly extracted cup on V60 or Wave despite trying a range of grind sizes. It just didn't wow me. Not sure why. I know that isn't that helpful. It was well balanced but just didn't have a lot of complexity to it. Flavors really stand out in this one. This makes an absolute brilliant iced coffee! Loving the berry paired with the delicate florals. The mouth feel was so close to that of a herbal tea that if you close your eyes you would swear you were drinking something much more appropriate to enjoy with the Queen of England than to help with your hangover. I was pleasantly surprised to have something so nuanced from a roaster I've heard little about, and to find out they were located in the same state I am was a nice addition. Overall I love the fruit forward nose in this cup, bodied with a light juicy body now I'm thinking I gotta try this one iced as soon as I get home. Another home run, I'm such a sucker for fruity Ethiopians though, maybe I'm a little bias. I could stand something similar with a big more rounded caramel back end I think. Can't wait for the next one! Really liked this cup. The fruit and tea-like qualities made for a balanced cup. Choreographed dances of delicate forward fruit, mid floral notes, and backend nuances of young earl grey tea. This was my favorite coffee. I look forward to getting more from this roaster. A waft of fruitiness upon opening the bag was enough to know that I was in for a sweet cup. No bitterness even if brewed a little over 4 minutes on v60. Notes of peach are distinct once brewed, tea-like body throughout. I find that if you let it cool a bit, you can taste the raspberry sparkling on your tongue. A really great cup! Early grey tea is a perfect note for this delicious coffee, Plus lots of delicate fruitiness. I like the hint of the fruits and the lighter hint of floral with this one. Very nice cup, acidity is light but present with lovely fruit notes. Body is nutty, but not very heavy. 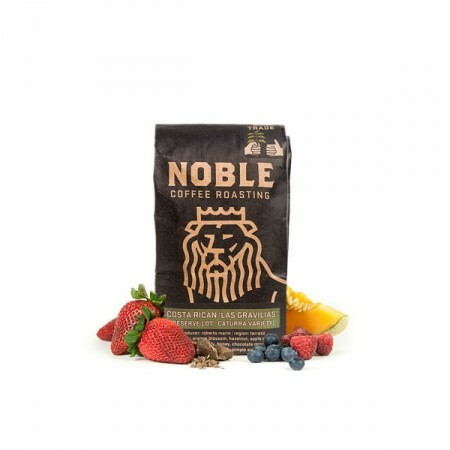 Noble Roasting is new to me, but they seem to know what they're doing.